Although we’re having a cold day in NYC, spring seems to be in the air. It’s the kind of feeling that inspires a person to find some cute new wedge sandals for the coming warm weather! A Google search for wedges led me to an ecommerce site called MakeMeChic, which sells trendy clothes and accessories in addition to shoes. 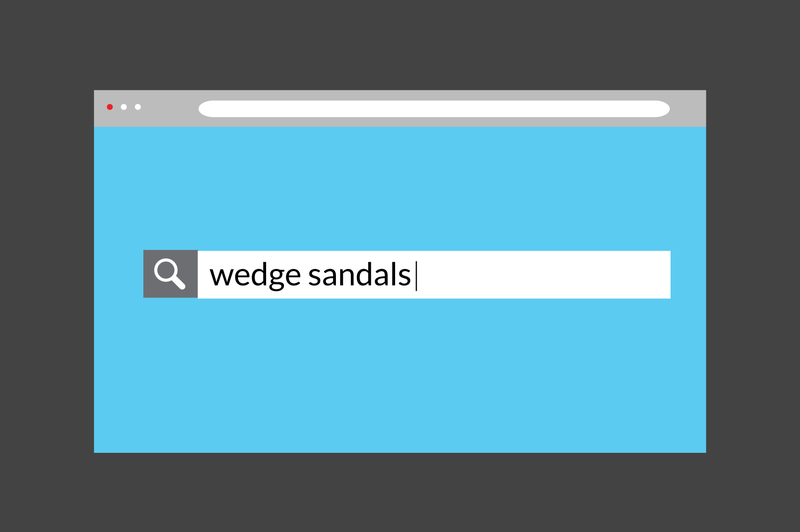 When I got to the site, I entered “wedge sandals” into the search function… and man was I disappointed in the results. It just gets better from there. I don’t want to pick on MakeMeChic because I get it. It’s hard to make a great ecommerce site search experience. Back at Endeca we built a $1B company on the back of great site search and navigation, and you don’t get to that size if just anyone can do it. But the key to a great site search experience isn’t just the technology; it’s the data. That is, to have a great search experience you must have great data to start with. If products are incorrectly categorized or described you’re going to get crappy results. As they say, garbage data in, garbage results out. And you end up on eCommerce Outtakes as a shining example of how not to make money online. The root of bad data is simply that people are busy (and cleaning bad data is a brutally time-consuming task). Suppliers are trying to cobble together data for dozens or hundreds of different online channels, each with their own requirements. Retailers are getting spreadsheets and PDFs and all manner of crappy, inconsistent data as a result and it’s just too hard to make it all consistent by hand. So, short of sleeping less and spending more hours working on your carpal tunnel syndrome copying and pasting data, what can you do? At least part of the solution going forward is going to come from better data standards for some of the key product information coming from your suppliers. Data standards are definitely boring. But in this case they save you time and make you more money, so it’s worth paying attention. The barcode is about the only (nearly) universal standard in all of commerce. There are other technologies used by at least larger firms (e.g. EDI for inventory and fulfillment), but the barcode is about the only thing you can depend on being consistent across a supply chain over time (…most of the time anyway; sorry entire apparel industry! More on your pain later). The organization behind the humble barcode – see our infographic on the complete history of the barcode, which is much more interesting than you think! – is GS1, and they’ve been very vocal recently about how “smart search relies on getting the data right”. GS1 is moving beyond the UPC codes and GTINs and looking to help companies get product information in general via the Structured Commerce Classification initiative, which is clearly explained in this video. Simply stated: why not have standards beyond the barcode? If we could agree, for example, on standard ways to represent shipping weight, case pack size, and other key pieces of data for vendor onboarding, wouldn’t life be easier for everyone involved? For those of you geeky enough to follow data standards on the web, there is already a very large movement backed by Google, Microsoft, and Yahoo! called schema.org. Schema.org defines a basic, common vocabulary by which ecommerce sites can label their product information for better search. As a quick aside: using schema.org on your site today is a no brainer. It will take an average programmer in IT less than an afternoon to make it work on your site today, and the impact on your search rankings can be significant. For example, Best Buy saw a 30% increase in traffic, and that was before Google, Microsoft, and Yahoo! Started supporting the initiative. Structured Commerce Classification helps suppliers and retailers exchange consistent data, while schema.org helps search engines identify products on your site and list them correctly in search results with rich data like images and prices. So eventually you will (or should) be using both to make your life easier and make more money in the process. As I mentioned above, schema.org is a no-brainer. Just do it. I know of very few things an ecommerce company can do that require so little effort for potentially significant results. As far as structured commerce goes, you can join the conversation and even start using some of it this year. Tools like our product at Salsify will begin importing, mapping, and exporting data consistent with the standards as they evolve, and some of the largest retailers are already participating. If you’re not the early adopter type, stay tuned. We’ll let you know when the standards are closer to finalization. This post was written in response to: "Smart Search Relies on Getting That Product Data Right".